Vienna-born Stephanie Drach studied at the Kunstuniversität Graz and Vienna’s Universität für Musik und darstellende Kunst. 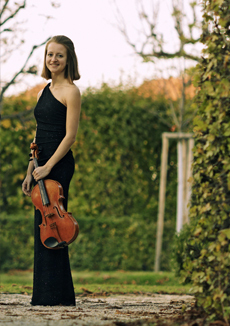 She has played in string quartets for ten years, and, with the Marc Aurel Quartett, received the 2015 Hajek Boss Wagner Kulturpreis and was invited to play at Vienna’s Konzerthaus, MITO (Milano/Torino) Settembre Musica, and Eisenstadt’s Haydnfestival. Prizewinner at the 2017 Turniej Kameralny (Poland), the Quartet performed at MuTh (hall of the Vienna Boys’ Choir), Vienna’s Musikverein, and Portugal’s Harmos Festival. She plays a Martin Schwalb viola, on generous private loan.